You may never need to walk a tightrope, but you still need to have a good sense of balance to complete the activities of your day. Your balance system is what allows you to sit, bend, walk and run without falling. When that balance system gets out of whack, an exciting environment called CAREN is here to help you get back to tightrope status. You maintain your balance through a complex interplay between your eyes, inner ear and what is called somatosensory feedback — sensations from your skin, muscles, tendons and joints. All of this information is fed to the brain. The continuous feedback system allows your brain to detect the movements of your body, integrate information such as obstacles in the path, the speed at which you are moving and the adjustments that must be made to keep you upright. If any part of the balance system doesn’t function properly, you may develop what is known as a balance disorder. Typical symptoms of a balance disorder include dizziness, feeling lightheaded or as if you are about to faint, and difficulty with eye-hand coordination. Your equilibrium is also upset, and you may have trouble walking, standing or bending over. People who have balance disorders compensate for their problems by using their bodies differently compared to those who don’t have a balance disorder. For example, someone with a balance disorder may sit down by using the arms of a chair to prevent just falling into the seat. Others may take short steps or shuffle their feet because long steps can throw off their balance. Our clinic uses an advanced technology called CAREN to help people who have balance disorders. We are the only provider of this specialized service in New York City. CAREN stands for Computer Assisted Rehabilitation Environment. This specialized rehabilitation system is completely different from conventional physical therapy, as it helps to reprocess or retrain your body to maintain its equilibrium. Many patients who have inner ear disturbance find conventional physical therapy ineffective, and some of the medications used have side effects. CAREN has been used successfully to help military pilots who suffer from motion sickness, which is similar to a balance disorder. CAREN can be used to provide Motion Based Equilibrium Reprocessing Therapy (MERT), which is a fancy way of saying that we retrain your body to balance itself through movement. You stand on a platform that moves under you (rather like standing on the deck of a boat) wearing a special harness to prevent falls. You may also use hand bars for extra support. As you move on the platform, the system analyzes your movements. The therapist works with you to help you learn new ways of moving. In front of you is a virtual reality screen; you keep your eyes fixed on a point in the screen while moving your body. These activities retrain your sensory system to improve your balance. Most patients need three to five treatments over two consecutive weeks. One great advantage of the CAREN system is that it provides doctors and therapists with objective measures of your performance and improvement. 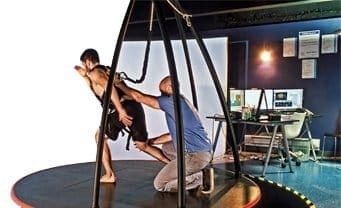 As you play specialized exercise games on the platform in the virtual reality environment, you will improve your postural stability and balance control.